In recent years, machine learning technologies and analytics have been widely utilized across the healthcare sector. Healthcare Analytics Made Simple bridges the gap between practising doctors and data scientists. It equips the data scientists&apos; work with healthcare data and allows them to gain better insight from this data in order to improve healthcare outcomes. This book is a complete overview of machine learning for healthcare analytics, briefly describing the current healthcare landscape, machine learning algorithms, and Python and SQL programming languages. The step-by-step instructions teach you how to obtain real healthcare data and perform descriptive, predictive, and prescriptive analytics using popular Python packages such as pandas and scikit-learn. The latest research results in disease detection and healthcare image analysis are reviewed. By the end of this book, you will understand how to use Python for healthcare data analysis, how to import, collect, clean, and refine data from electronic health record (EHR) surveys, and how to make predictive models with this data through real-world algorithms and code examples. Healthcare Analytics Made Simple is for you if you are a developer who has a working knowledge of Python or a related programming language, although you are new to healthcare or predictive modeling with healthcare data. 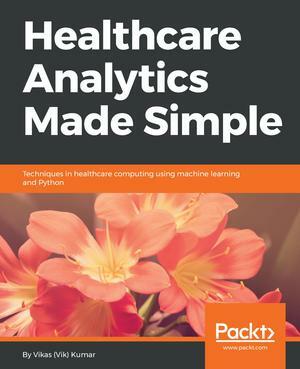 Clinicians interested in analytics and healthcare computing will also benefit from this book. This book can also serve as a textbook for students enrolled in an introductory course on machine learning for healthcare.